The new 5 Spot first ride.. 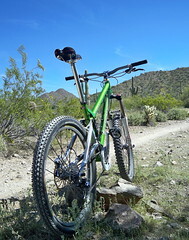 Props to chollaball and other MTBer's that got out and shored up some of the trail. Could see the results of their handywork, as well as the signage to try and dissuade others from hacking up the water bars. Stopped to hack together a panoramic view looking off towards Red Mountain and the Salt River. Clicking the link will take you to the full size version on Flickr.